"My kids love the taquitos we get at the grocery store in the freezer aisle. They would happily eat them every day. However, the mean mommy that I am, am working on reducing the amount of processed food in our diet so I had to try homemade. After checking all the recipes for taquitos I could find, I decided to mix it up and create my own! So I took ideas from about 4 different recipes and went to town. My kids and husband have given their seal of approval. My very picky 3-year-old even had seconds! I serve them on a bed of lettuce with sour cream and do Mexican rice on the side." Combine chicken, beans, diced tomatoes with green chile peppers, diced green chile peppers, cumin, chili powder, salt, and garlic in a saucepan over medium heat; cook and stir until filling is heated through, 5 to 10 minutes. Add Mexican cheese blend to filling and stir until cheese is melted, 2 to 3 minutes. Remove saucepan from heat. Place corn tortillas on a microwave-safe plate and cover with a wet paper towel; heat in microwave until tortillas are warmed, about 30 seconds. Spoon 2 to 3 tablespoons filling down the middle of each tortilla. Roll tortilla tightly around the filling and place, seam-side down, on a baking sheet. Spray the rolled tortillas with cooking spray. Bake in the preheated oven until lightly browned and crispy, about 30 minutes. 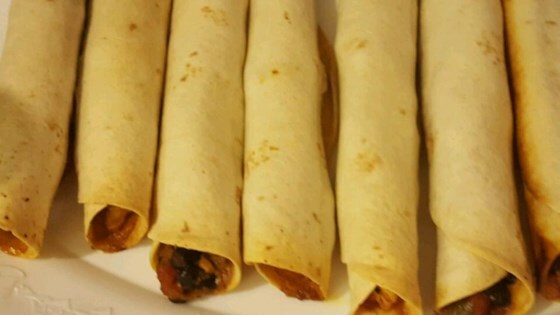 Homemade taquitos are so tasty and easy! Flour tortillas can be used in place of corn tortillas. Didn't use any cheese and added bell pepper and I thought it was bland. I think I'm going to try adding enchilada sauce on top and shredded cheese. This recipe is fantastic. I've tried other recipes and this one is a winner. Great flavor! Took 100 to church pot luck and they were devoured! I added a small can of chili for a little extra kick!